FedEx Corp. (NYSE: FDX) provides customers and businesses worldwide with a broad portfolio of transportation, e-commerce and business services. With annual revenues of $30 billion, the company offers integrated business applications through operating companies competing collectively and managed collaboratively, under the respected FedEx brands. 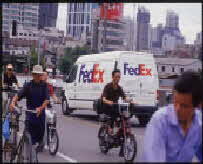 FedEx worldwide network services links 220 countries. Consistently ranked among the world's most admired and trusted employers, FedEx inspires its more than 250,000 employees and contractors to remain "absolutely, positively" focused on safety, the highest ethical and professional standards and the needs of their customers and communities. To identify, recruit, qualify and attract a Manager of Strategic Global Television Programming to produce compelling stories across multiple media platforms about the FedEx organization and FedEx employees who make the company one of the best to work for in the world. A creative media executive capable of finding common ground to build relationships with employees, cultures, clients and shareholders of this Fortune 100 Company. The Director of Global Communications had built a world class corporate communications organization and was now looking to hire a talented producer of content that could serve multiple corporate clients with varied messages to covey. Autonomy was key on a business, technical and creative level. Filcro Media Staffing with Tony Filson as Officer in Charge of Search participated in a number of meetings in New York City with the Director of Global Corporate Communications who gave clear insights into the current and future plans for this critical environment within FedEx. The DGC being a noted talented executive producer was looking for a distinctive feel to the current body of work of each candidate and provided reels of pieces in production currently that should be used as means while Filcro Media Staffing reviewed each producer's work. Over 80 talented programming and production professionals were profiled from all over the world by Filcro Media Staffing for this Corporate Communications executive search. The search universe consisted of candidates from every ISIUC listed for review. After extensive interviews in New York City and Memphis and compiling three tiers of qualified candidates, when the top two candidates were placed side-by-side, it was difficult to choose just one, because both were a perfect fit from a creative, business and cultural perspective. Candidates were sourced from Asia, South America, Africa and the United States all relevant to FedEx from a business and cultural perspective. The materials reviewed on each candidate were broad and included writing and production elements plus strategic justification statements. Filcro Media Staffing proceeded to Identify global organizations with specific "production" and “programming” environments that produce quality content similar to the client’s needs. Recruiting from the identified universe in the United States proved to be more productive than any other market. Based on the necessity of identifying an executive who could garner internal consensus and partner with those outside of media environments who had media needs, we needed a person who could convey ideas in “English” and not “Media” at times. The acceptance and assimilation into the corporate culture of a U.S. based Fortune 100 would make the balance of business, technical and creative skills a delicate undertaking. Art versus science. A EMMY recipient and multiple EMMY nominee of work product directly related to the global interests of FedEx with TV and long form experience that creatively told compelling stories regardless of geographic or culture. Also, as the recipient of the NANCY REYNOLDS AWARD while at ABC 20/20 she proved to be an exceptional talent who was recognized by her peers and the broadcasting community for her exceptionally high standards. As Executive Producer she had extensive international, domestic, creative and business experience with: ABC, Hallmark, MSNBC, History Channel, Discover Communications, Court TV, FOX and many others where her work was respected and recognized. Her experience in the United States, Asia and Europe enabled her to relate to a diverse global community of employees, customers and cultures that make up the fabric of FedEx. Her equal aplomb in a boardroom, production meeting or edit session made her a perfect fit for the demanding corporate culture she would be functioning within serving a diverse constituency. The corporate communications executive was successfully attracted and relocated to Memphis. She has proven to be a vital resource in the conveyance of ideas, concepts, feelings and important messages to shareholders, the public, and over 200,000 dedicated employees from varied cultures who work for this leading global corporation. Review of Filcro Media Staffing International media and broadcasting executive search firms across multiple media platforms. Tony Filson Officer in Charge of Search Filcro Media Staffing International - Copyright 1985 - 2014 All Rights Reserved for Reviews. http://www.ExecutiveSearch.TV Filcro Media Staffing, Inc.